I'm still working on my laundry room! I'm trying to pack in as much as I can into this little area. 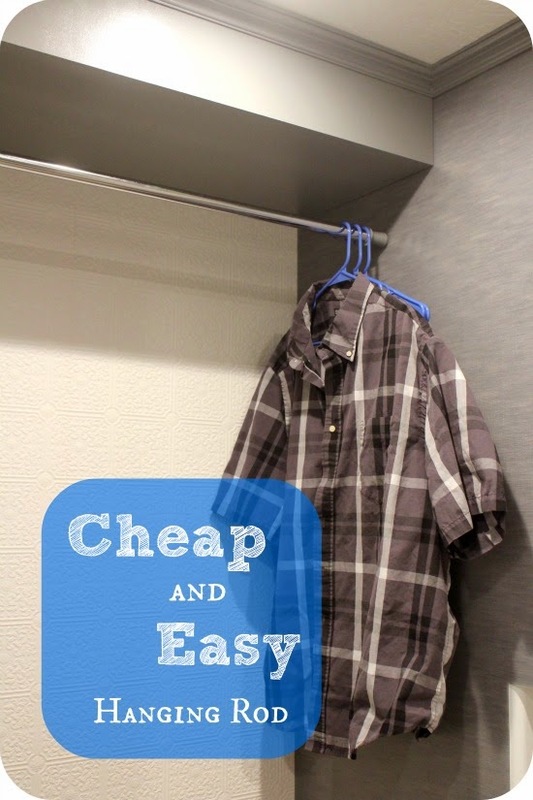 I want to be able to hang clothes as soon as they come out of the dryer which saves ironing time!!! So I needed a hanging bar. I really wanted a silver bar, so a wooden closet rod was not happening. I already had a silver bar we had taken out of a closet, but the installation bracket was weird and not very attractive. It was the perfect solution and to make it even better, I wouldn't have to drill holes in my grey linen walls!! WOOT WOOT! I needed a rod that was 40 inches, so off to the store I went. I found one that adjusted from 40 inches to 72 inches, perfect!! I'm not sure if the package lied or my space was just under 40 inches, but it did not fit!! No problem I thought, I'll just cut it off. So I measured and marked the bar, and then my hubby unscrewed the end cap; he's so strong. Next, I tried to take off the white plastic insert that allows the end cap to screw on. Tried is the optimal word!! I used a screw driver, pliers, and a utility knife!! Nothing was getting that thing to budge!!! So I did the only thing and sane person would do, I cut the pipe at my mark with the plastic piece in the end. Then I used tin snips and cut the pipe off the plastic insert!! Worked like a charm!! Then I hammered it back into the shortened pipe. I screwed the end cap back on and put her up! Yeah!! I'm thinking that's the easiest install I've done, and it looks amazing! I just love how this room is coming together and how functional it it becoming!! I'll be back soon for some posts on my $35 counter top!! I am new to your site and have LOVED everything!!! I'm from Tooele and was so excited to see that you are from Utah. I actually went to the reuseit store the other day and was so thankful that I knew about it from you!! Thanks for the great ideas. I am super excited to see your laundry room. Keep up the good work! !